A new technology being tested by University of Alberta scientists could revolutionize human papillomavirus (HPV) related cancer diagnostics and cervical cancer screening. The technology, a minimally invasive swab assay, is being used to detect the development of HPV-related tumours in patients in a pilot study being conducted in Edmonton and Nairobi, Kenya. Developed at the U of A, the technology breaks down samples into thousands of nanometer-sized water-in-oil droplets and tests each of them individually to detect levels of DNA, RNA and proteins to identify the presence of cancer-causing HPV. According to the team who developed it, the technology is the most sensitive screening assay for cancer-causing HPV ever developed. "People have been trying to create a test using throat swabs or saliva to be able to identify cancer-causing HPV. A lot of the samples had so little DNA or RNA that it was hard to get reasonable outcomes," says Andre Isaac, a former resident in otolaryngology in the U of A's Department of Surgery and a current fellow in pediatric otolaryngology at Lurie Children's Hospital of Northwestern University in Chicago. "We started using droplet digital PCR to test for the mRNA of certain HPV oncoproteins. It is very specific and tells you if the HPV is causing cancer in those cells." HPV-related head and neck cancer is one of the fastest-growing cancers in the world and is thought to cause up to 70 per cent of new throat cancers in North America. Through the study, the researchers are recruiting patients with either HPV-related head and neck cancer or cervical cancer and testing swabs through the ddPCR technology to determine their risk of developing another HPV-related cancer in the future. The team is also trying to determine whether the technology can be used as a screening test in patients who aren't showing symptoms. In a separate arm of the study, the scientists are using the technology in Kenya to determine how well self-administered cervical swabs perform against the current gold standard, which is Pap smear testing. The researchers believe the technology addresses a major need outside of North America. "For HPV-related cervical cancer, North America has been using Pap testing for decades and it has been very successful. However, it's been a failure in HPV endemic areas—especially East Africa, where an estimated two per cent of the at-risk population actually gets screened," said Isaac. He added there are several reasons for the low uptake in East Africa, which has the highest prevalence of cervical cancer in the world and a mortality rate of approximately 50 per cent. They include cultural barriers to undergoing a cervical exam because of the semi-invasive nature of the procedure, lack of easy access to a physician for much of the population and the need for an expert pathologist to read and interpret samples. The new technology promises to help break down those barriers. "Basically you can have community service workers distributing these samples and women can test themselves at home and have the samples picked up or sent in. Or they can still get them done at a clinic but not necessarily require somebody that can do a Pap smear," said Isaac, adding that in the right circumstances the diagnostic also promises significant savings to the health-care system. "If you look at the cost of HPV DNA testing sample by sample, it's more expensive. But if you are able to test hundreds of patients at the same time digitally without the need for expensive personnel, it can actually be significantly more cost-effective," said Isaac. "It's actually the perfect thing to apply to a resource-limited setting, because the problem is so rampant that if you are able to get such high throughput, you can make it way more cost-effective than a Pap smear." 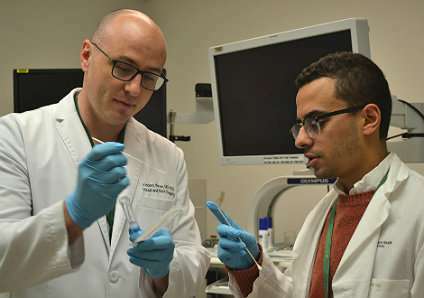 The pilot study is supported by a $100,000 Grand Challenges Stars in Global Health grant to Isaac and Vincent Biron, an assistant professor of surgery at the U of A. The pair and other team members visited East Africa this past summer to begin the Kenya arm of the project. They will test the technology over the next 18 months to determine the effectiveness of self-cervical screening and its use as a diagnostic tool. As a result of the work being done in Kenya, Biron and Isaac have also established a partnership with the otolaryngology department at Moi Teaching and Referral Hospital at Moi University in Eldoret, Kenya. The ongoing surgical partnership will address needs related to head and neck cancer and other otolaryngology-related diseases in underserved populations in Kenya.